!Press the yellow dot on the cover of this interactive children's book, follow the instructions within, and embark upon a magical journey! Each page of this surprising touch book instructs the reader to push the button, shake it up, tilt the book, and who knows what will happen next! Children and adults alike will giggle with delight as the dots multiply, change direction, and grow in size! Especially remarkable because the adventure occurs on the flat surface of the simple, printed page, this unique interactive picture book about the power of imagination and interactivity will provide read-aloud fun for all ages! PRESS HERE, MIX IT UP!, LET'S PLAY!, and SAY ZOOP! 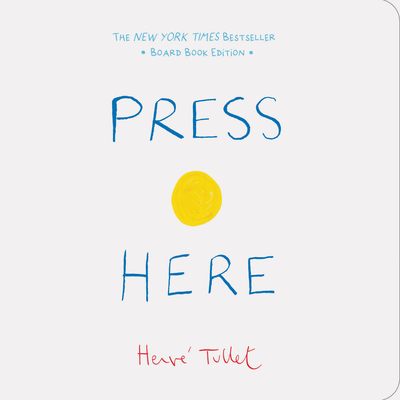 Collect all four interactive books from Hervé Tullet.